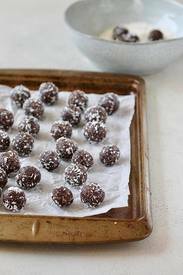 These Chocolate Energy Bites from Hey Nutrition Lady are naturally sweetened with dates for a healthy snack. They are made with only 4 ingredients, plus a pinch of salt and a bit of cinnamon if you want to get fancy. This energy bites recipe is vegan, gluten-free, and Whole 30 compliant:.